A Quadrilateral is a four-sided polygon with four definite segments. It has four edges and vertices. On the other hand, a circle is the locus of multiple points in a plane that is equidistant from a fixed point. If all four vertices of a quadrilateral lie on the circumference of a circle then it becomes a cyclic quadrilateral. In other words, when four points on circle circumference are connected with vertices of a quadrilateral then it will become a cyclic quadrilateral. It is visualized as this is quadrilateral inscribed within a circle. In the figure given below, ABCD is the cyclic quadrilateral. Let us start with an activity. Take one circle and choose any four points at the circumference of the circle. Now connect these points together to form a quadrilateral. The next step is to measure the angles formed at the vertices of the cyclic quadrilateral. The sum of all four angles should be 360-degrees to form a cyclic quadrilateral. The opposite angles on the vertices would be supplementary. The cyclic quadrilateral theorem states that sum of either pair of opposite angle is always supplementary. A cyclic quadrilateral is inscribed below with the center O and its two possible conditions are also shown below. The converse of the theorem is also possible that states that if two opposite angles of a quadrilateral are supplementary then it would be a cyclic quadrilateral. Cyclic quadrilaterals are useful in a variety of geometry problems particularly those where angle chasing is needed. If this is not possible to add points intentionally then you should explore the properties of cyclic quadrilateral ahead for more details. The perfect example of a cyclic quadrilateral is wheels on your bicycle that has been by almost everyone around the world. Not every quadrilateral is cyclic but we could name a few that you are familiar with. For a rectangular figure or square, this is possible to draw a circle touching all the points on the circumference. But this is not possible in the case of non-rectangular figures. 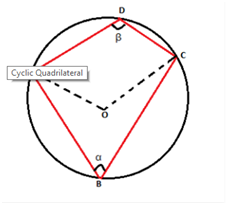 There are more interesting concepts related to cyclic quadrilaterals other than circle. Here, we are giving some of the properties that are necessary to learn when you are practicing maths online. It will help you in becoming more competitive and a good scorer too. The sum of the opposite angle of a cyclic quadrilateral is always 180-degree. In other words, angle A + angle C = 180, and angle B + angle D = 180. There are many techniques to prove this theorem but the best method is using arc measures and inscribed angles. When you will refresh the memory, an inscribed angle is the angle that the vertices on the circumference of circle. You must check that all the angle of a cyclic quadrilateral are inscribed angles. We know that measure of each inscribed angle is always the half of an intercepted arc. In this way, this is easy to derive the proof of the theorem with the right technique and right approach.